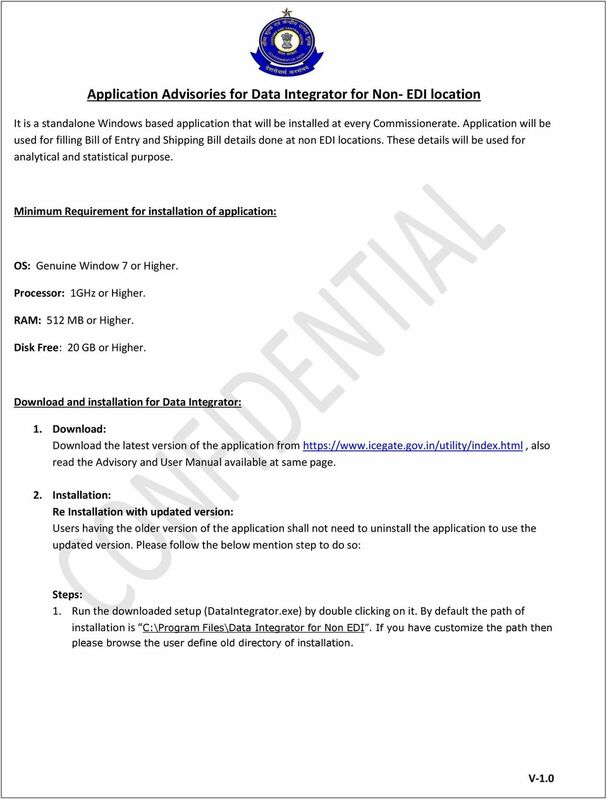 Download "Application Advisories for Data Integrator for Non- EDI location"
1 Applicatin Advisries fr Data Integratr fr Nn- EDI lcatin It is a standalne Windws based applicatin that will be installed at every Cmmissinerate. Applicatin will be used fr filling Bill f Entry and Shipping Bill details dne at nn EDI lcatins. These details will be used fr analytical and statistical purpse. Minimum Requirement fr installatin f applicatin: OS: Genuine Windw 7 r Higher. Prcessr: 1GHz r Higher. RAM: 512 MB r Higher. Disk Free: 20 GB r Higher. Dwnlad and installatin fr Data Integratr: 1. Dwnlad: Dwnlad the latest versin f the applicatin frm als read the Advisry and User Manual available at same page. 2. 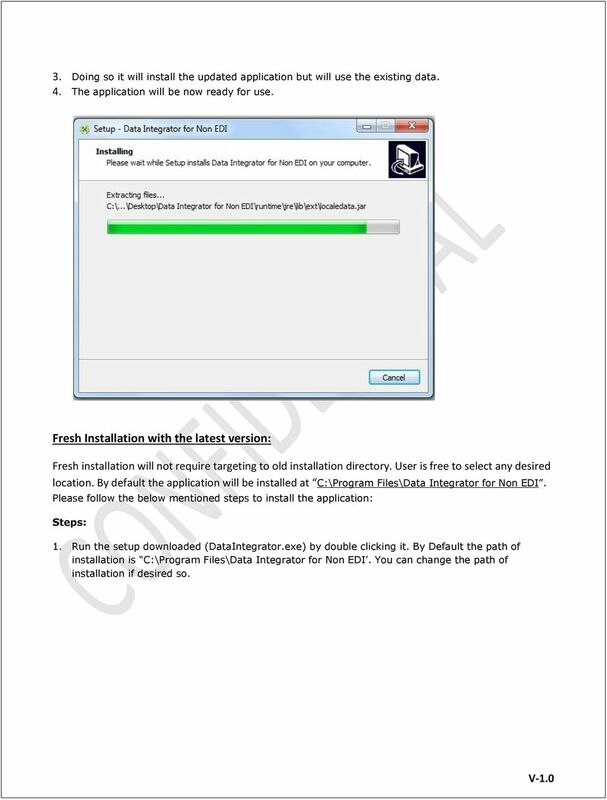 Installatin: Re Installatin with updated versin: Users having the lder versin f the applicatin shall nt need t uninstall the applicatin t use the updated versin. Please fllw the belw mentin step t d s: Steps: 1. Run the dwnladed setup (DataIntegratr.exe) by duble clicking n it. By default the path f installatin is C:\Prgram Files\Data Integratr fr Nn EDI. If yu have custmize the path then please brwse the user define ld directry f installatin. 2 2. It will ask if yu want t verwrite the existing file, please click yes. 3 3. Ding s it will install the updated applicatin but will use the existing data. 4. The applicatin will be nw ready fr use. Fresh Installatin with the latest versin: Fresh installatin will nt require targeting t ld installatin directry. User is free t select any desired lcatin. By default the applicatin will be installed at C:\Prgram Files\Data Integratr fr Nn EDI. Please fllw the belw mentined steps t install the applicatin: Steps: 1. Run the setup dwnladed (DataIntegratr.exe) by duble clicking it. By Default the path f installatin is C:\Prgram Files\Data Integratr fr Nn EDI. 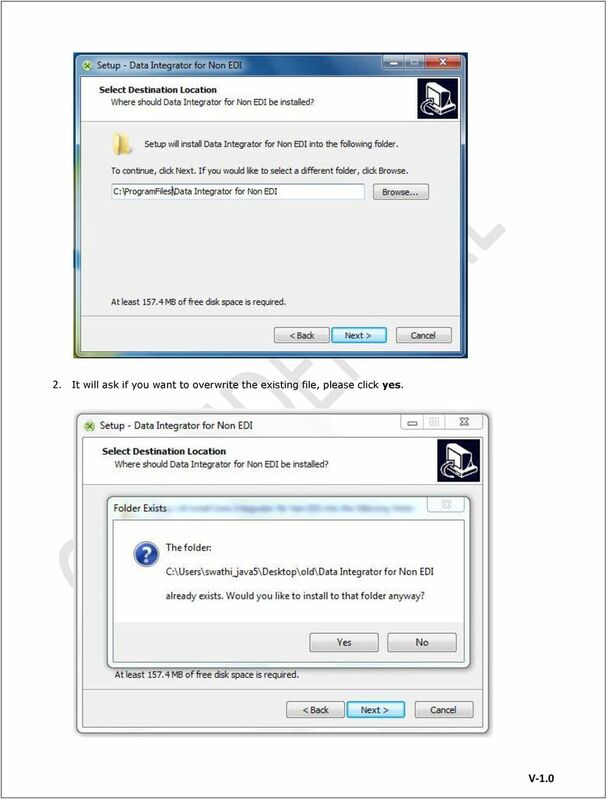 Yu can change the path f installatin if desired s.
4 1.1 Applicatin deplyment page. 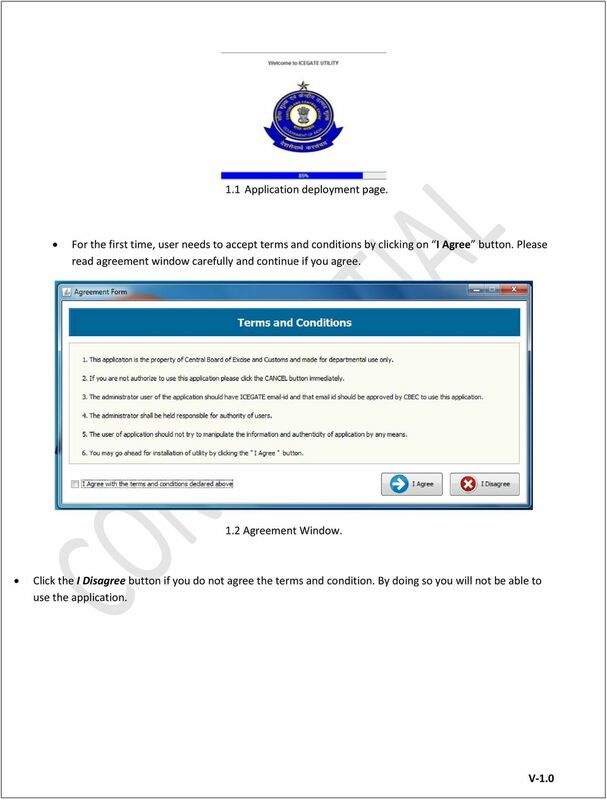 Fr the first time, user needs t accept terms and cnditins by clicking n I Agree buttn. Please read agreement windw carefully and cntinue if yu agree. 1.2 Agreement Windw. Click the I Disagree buttn if yu d nt agree the terms and cnditin. By ding s yu will nt be able t use the applicatin. 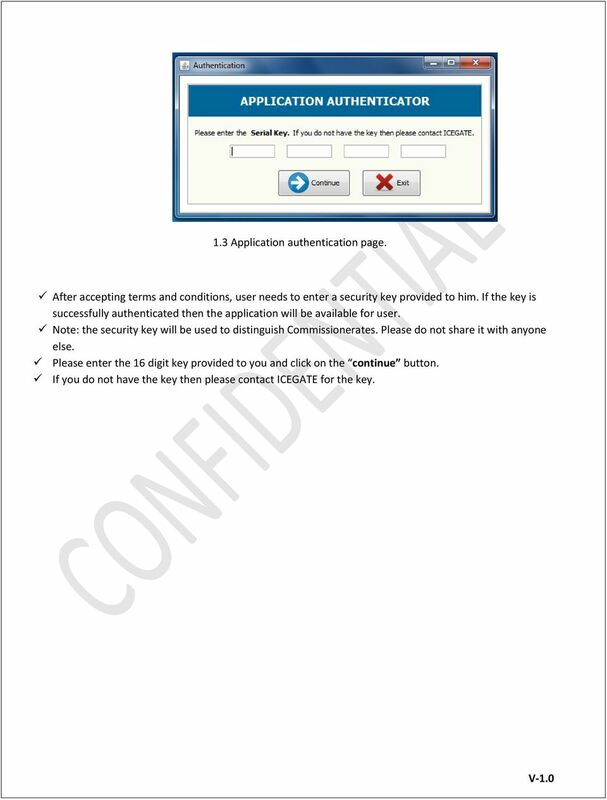 5 1.3 Applicatin authenticatin page. After accepting terms and cnditins, user needs t enter a security key prvided t him. 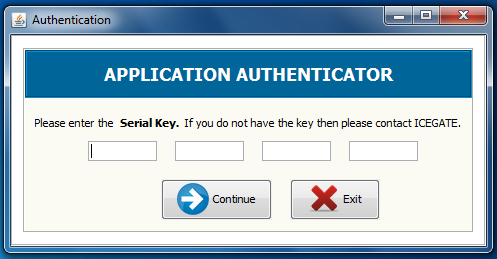 If the key is successfully authenticated then the applicatin will be available fr user. Nte: the security key will be used t distinguish Cmmissinerates. Please d nt share it with anyne else. Please enter the 16 digit key prvided t yu and click n the cntinue buttn. If yu d nt have the key then please cntact ICEGATE fr the key. 6 2. Lgin Windw : After Installatin Lgin windw will be pen. 2.1 Lgin windw. Lgin windw will prvide the three buttns. I. Lgin: Use this if yu have the lgin username and passwrd. Username are usually id. II. New User: This ptin can nly be used nce by the Cmmissinerate. Using this ptin the user directly becmes the Administrative user. III. 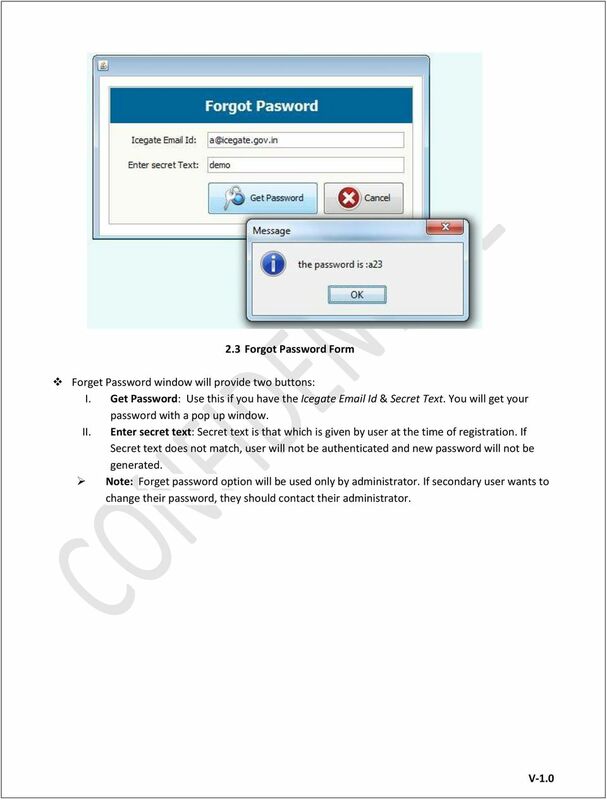 Frgt Passwrd: This ptin can nly be used by the Cmmissinerate t retrieve his/her passwrd given that the user prvides the crrect secret key entered by him during the registratin. 7 After clicking n New User, Administratr Registratin windw will pen. 2.2 Administratr Registratin Frm. The id shuld be f ICEGATE dmain. Example: D nt leave any f the fields blank. If s user will nt be allwed t prceed further. Only ne user will be allwed t use this feature. 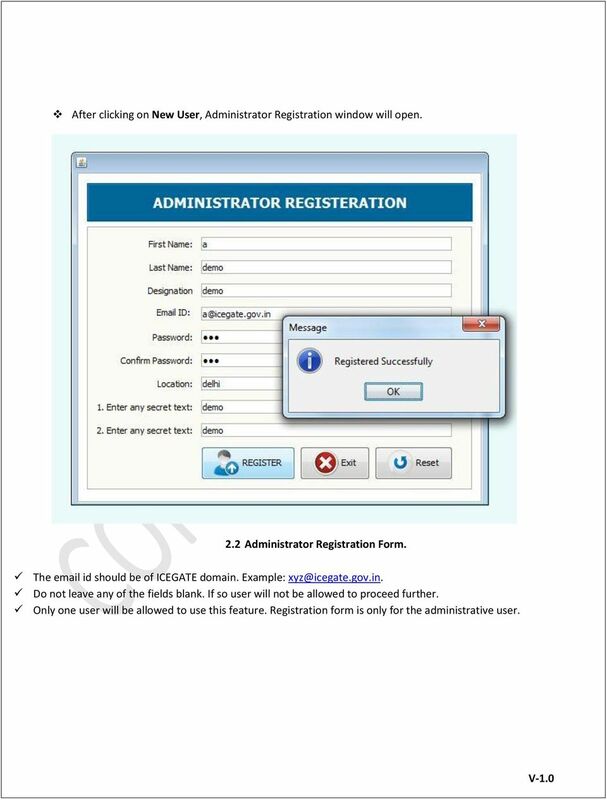 Registratin frm is nly fr the administrative user. 8 2.3 Frgt Passwrd Frm Frget Passwrd windw will prvide tw buttns: I. Get Passwrd: Use this if yu have the Icegate Id & Secret Text. Yu will get yur passwrd with a pp up windw. II. Enter secret text: Secret text is that which is given by user at the time f registratin. If Secret text des nt match, user will nt be authenticated and new passwrd will nt be generated. Nte: Frget passwrd ptin will be used nly by administratr. 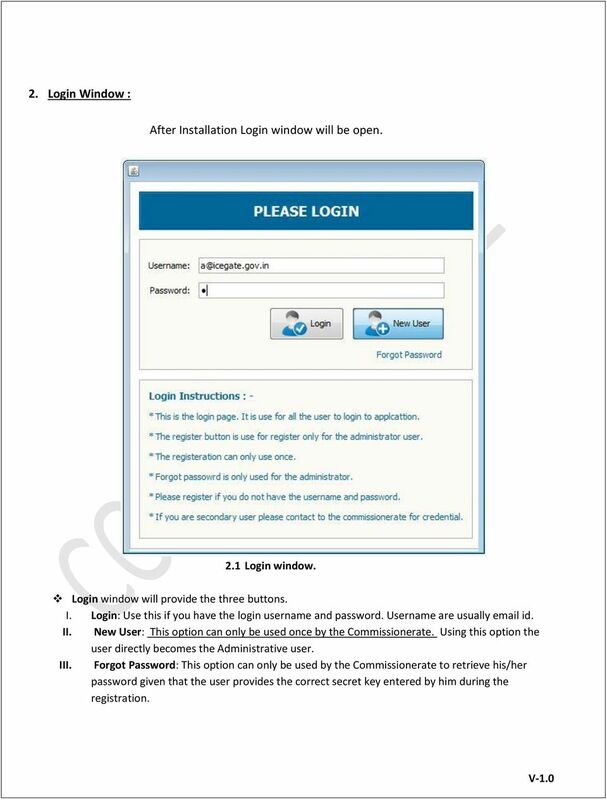 If secndary user wants t change their passwrd, they shuld cntact their administratr. 10 3.1.1 Bill f Entry: BE is divided int three parts t fill all the related details : a.) BE Master Details: Yu can enter master details fr Bill Of Entry like Lcatin cde, Bill f entry type, IE cde and CHA cde etc. BE Master Details windw will prvide three buttns : I. Save: After filling all crrect details yu can save all these details by clicking n this save buttn. Save buttn will be enable after saving Invice and Item details. II. Add Invice: After clicking n Add Invice details, BE Invice details windw will pen,where yu can fill all invice details. III. 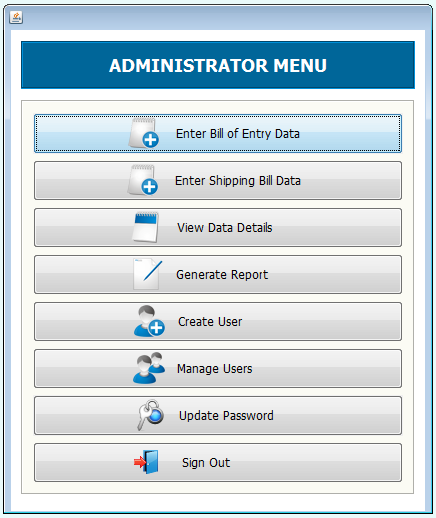 Hme: After clicking n Hme buttn, Administratr Menu will be displayed. 11 b.) BE Invice details: Yu can enter all details related t Invice like Invice n., Invice date etc. BE Invice Details windw will prvide three buttns : I. Add Item: After clicking n Add Item details, BE Item details windw will pen, where yu can fill all item details. II. Save: After filling all crrect details yu can save all these details by clicking n Save buttn. Save buttn will be enable after saving all Item details. 12 c.) BE Item Details: Yu can enter all required details f BE Items like Item Serial N. f invice, Quantity, Brand and cuntry f rigin etc. BE Item Details windw will prvide fur buttns : I. Save: After filling all crrect details yu can save all these details by clicking n this Save buttn. II. Reset: After clicking n Reset buttn, all fields will be blank. 13 Steps after saving BE Item Details : A message bx will cme, if yu want t add mre item details then click n YES. If yu d nt wants t add mre item details then click n NO. If yu d nt want t add mre item details, yu will g back t BE Invice Details windw. Nw yu will find Save buttn is enable in BE Invice Details. 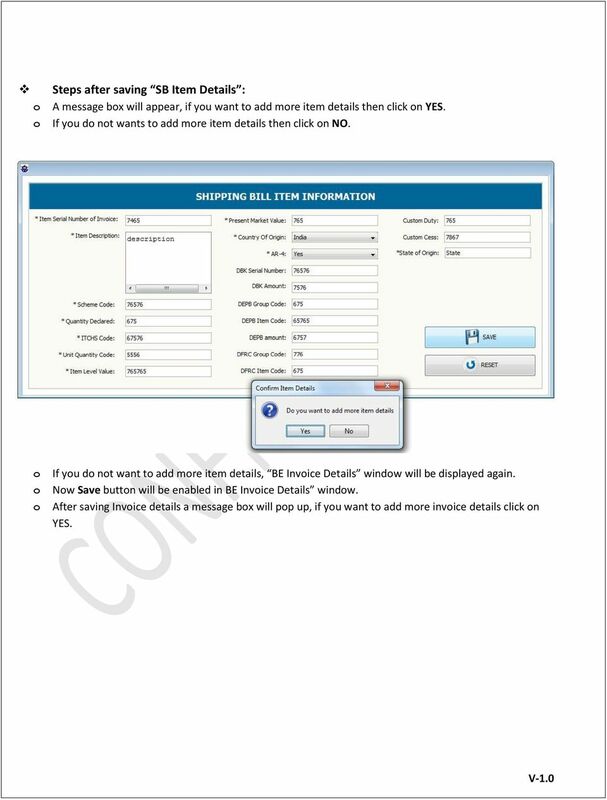 After saving Invice details a message bx will cme, if yu want t add mre invice details click n YES. 14 If yu d nt wants t add mre invice details click n NO, BE Master Details windw will be displayed again as shwn belw. Nw Save buttn will be enabled n BE Master Details windw. Yu can save all BE details, by clicking n Save buttn. 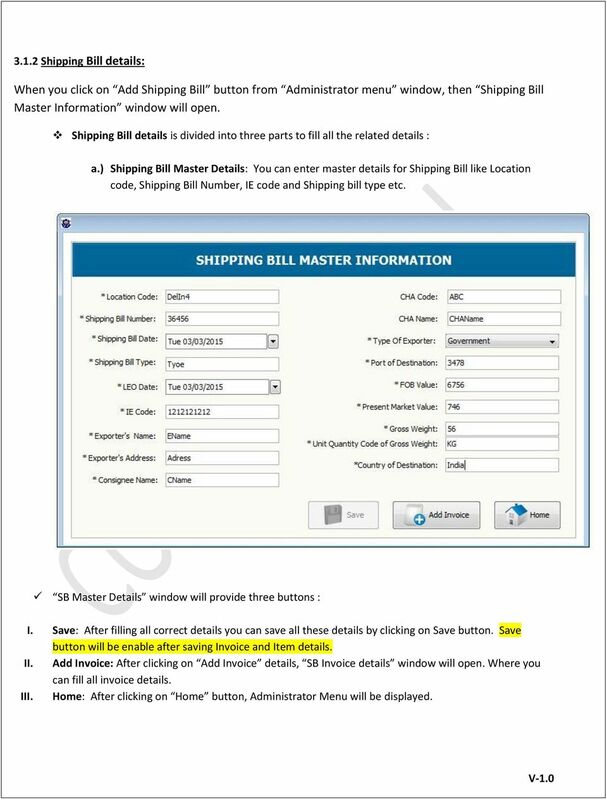 16 3.1.2 Shipping Bill details: When yu click n Add Shipping Bill buttn frm Administratr menu windw, then Shipping Bill Master Infrmatin windw will pen. 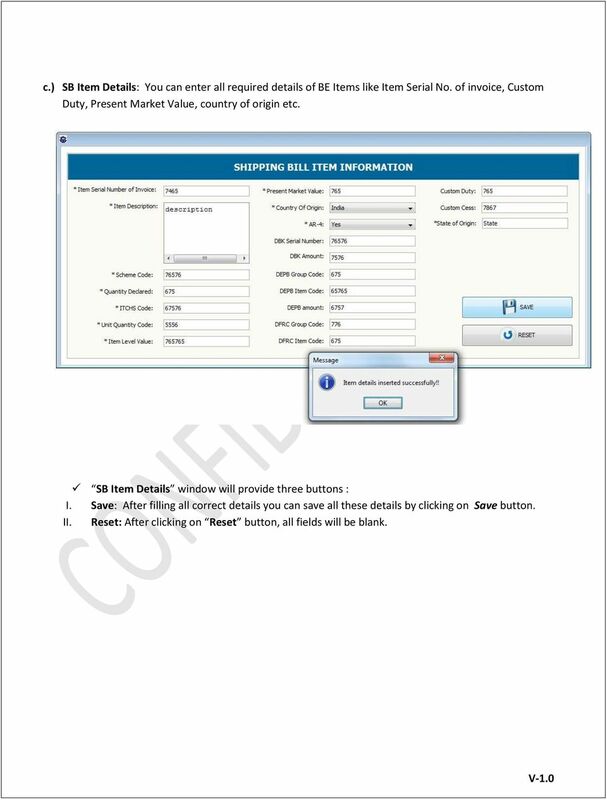 Shipping Bill details is divided int three parts t fill all the related details : a.) 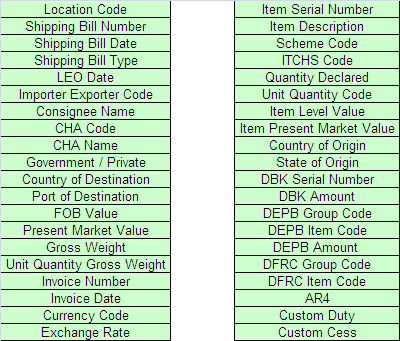 Shipping Bill Master Details: Yu can enter master details fr Shipping Bill like Lcatin cde, Shipping Bill Number, IE cde and Shipping bill type etc. SB Master Details windw will prvide three buttns : I. Save: After filling all crrect details yu can save all these details by clicking n Save buttn. Save buttn will be enable after saving Invice and Item details. II. Add Invice: After clicking n Add Invice details, SB Invice details windw will pen. Where yu can fill all invice details. III. Hme: After clicking n Hme buttn, Administratr Menu will be displayed. 17 b.) SB Invice details: Yu can enter all details related t Invice like Invice n., Invice date etc. SB Invice Details windw will prvide three buttns : I. Add Item: After clicking n Add Item buttn, SB Item details windw will be pen. Where yu can fill all item details. II. Save: After filling all crrect details yu can save all these details by clicking n Save buttn. Save buttn will be enable after saving all Item details. 18 c.) SB Item Details: Yu can enter all required details f BE Items like Item Serial N. f invice, Custm Duty, Present Market Value, cuntry f rigin etc. SB Item Details windw will prvide three buttns : I. Save: After filling all crrect details yu can save all these details by clicking n Save buttn. II. Reset: After clicking n Reset buttn, all fields will be blank. 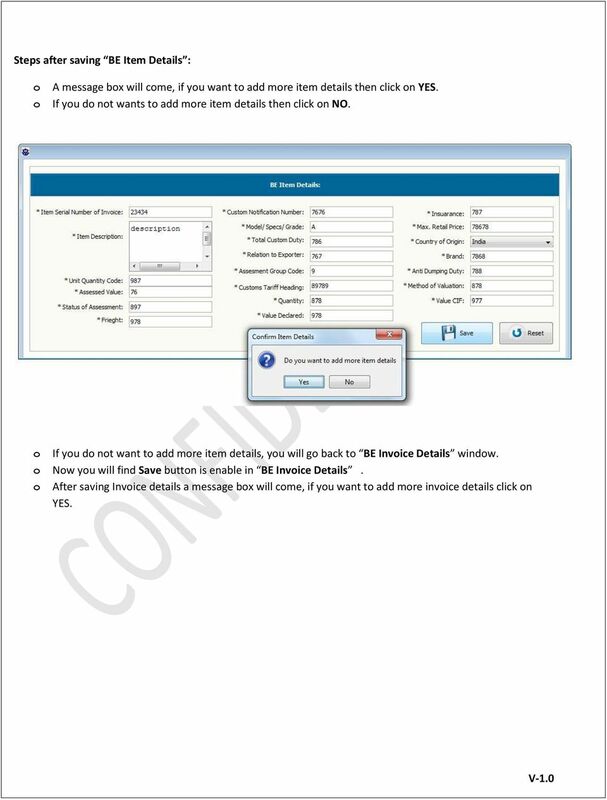 19 Steps after saving SB Item Details : A message bx will appear, if yu want t add mre item details then click n YES. If yu d nt wants t add mre item details then click n NO. If yu d nt want t add mre item details, BE Invice Details windw will be displayed again. Nw Save buttn will be enabled in BE Invice Details windw. After saving Invice details a message bx will pp up, if yu want t add mre invice details click n YES. 20 If yu d nt wants t add mre invice details click n NO, BE Master Details windw will be displayed as shwn belw. Nw yu will find Save buttn is enable f BE Master Details windw. Nw yu can save all BE details, by clicking n Save buttn. If all fields are valid then pp will cme BE master details inserted successfully after clicking n Save buttn. 22 3.1.3 View By clicking n View Details buttn frm Administratr Menu, belw screen will pen. View windw will prvide five buttns: I. Display Data: Yu have t chse data type frm drp dwn menu either Bill f Entry r Shipping Bill and frm anther drpdwn yu have t chse status either Pending r Submitted then click n Display Data buttn. It will shw all the details f BE/SB as per selected status Pending/Submitted. Nte: Yu can t click n View Mre after submitting data. II. Delete: Yu can delete BE/SB recrd by selecting that recrd and click n Delete Data buttn. III. 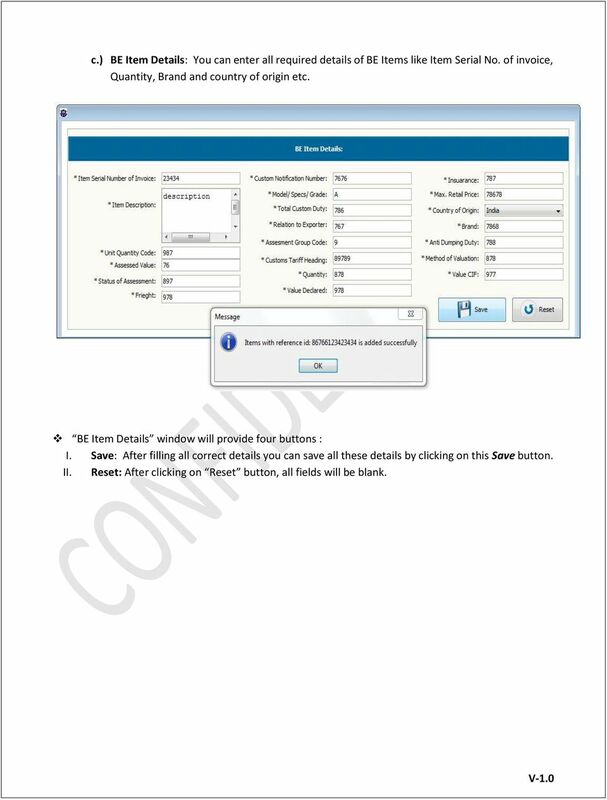 Submit Data: After selecting BE/SB recrd, yu can submit data by clicking n Submit Data buttn. IV. View mre: After searching yu can select particular recrd and it will shw the summarized details fr selected recrd by clicking n View Mre buttn. 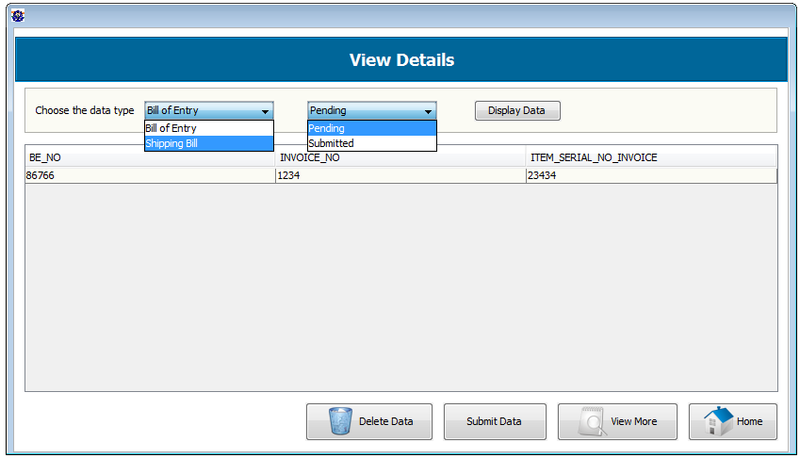 V. Hme: After clicking n Hme buttn, Administratr Menu will be displayed. 23 When yu will click n View Mre buttn then Summarized details will shw in a frm fr particular Invice N. /Bill f entry as shwn in belw image: Summarized windw will prvide tw buttns: I. Update: Yu can change details by clicking n update buttn. II. 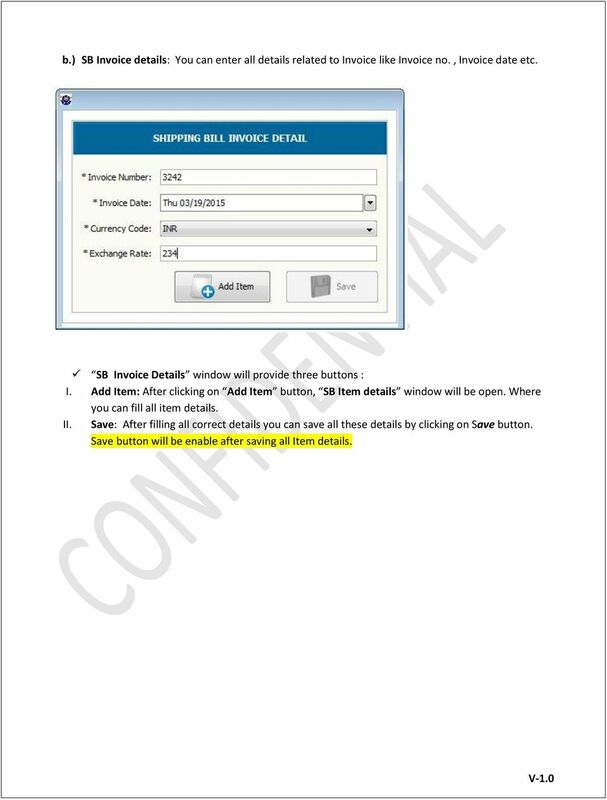 Cancel: After clicking n Cancel buttn, summarized windw will be clsed and View Details windw will reappear. 24 3.1.4 Generate Reprts: Only cmmissiner has right t generate reprt. If user wants t generate reprts fr BE & SB (imprt/exprt) between desired dates then click n Generate Reprt. Reprts will be generated in.csv frmat by clicking n generate buttn. Generate Reprts Generate reprt windw will prvide tw buttns: I. Generate: Generate buttn will generate Imprt/Exprt reprt in.csv frmat fr selected Date Frm and Date T. And that file will be save n installatin directry autmatically. II. Exit: Reprt Generatin windw will clse by clicking n Exit buttn. After prviding all required fields when user will click n Generate Reprt buttn then pp up message will appear reprt generate successfully n particular path. 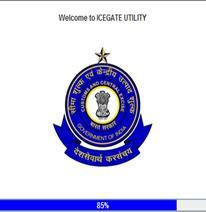 Nte: yu can generate reprt fr ICEGATE, DGCIS and DGOV. Reprt will be saved in tw flders (BE and SB) at given path. Bth flders will be divided in tree flders as ICEGATE, DGCIS and DGOV. Then user has t send Icegate reprt t Icegate id, DGOV user has t send reprt t DGOV id, DGCIS user has t send reprt t DGCIS id. 29 3.1.5 Create User Create User iv.) v.) It is restricted t be used nly fr cmmissiner t create user such as Maker, Checker r Mdifier. 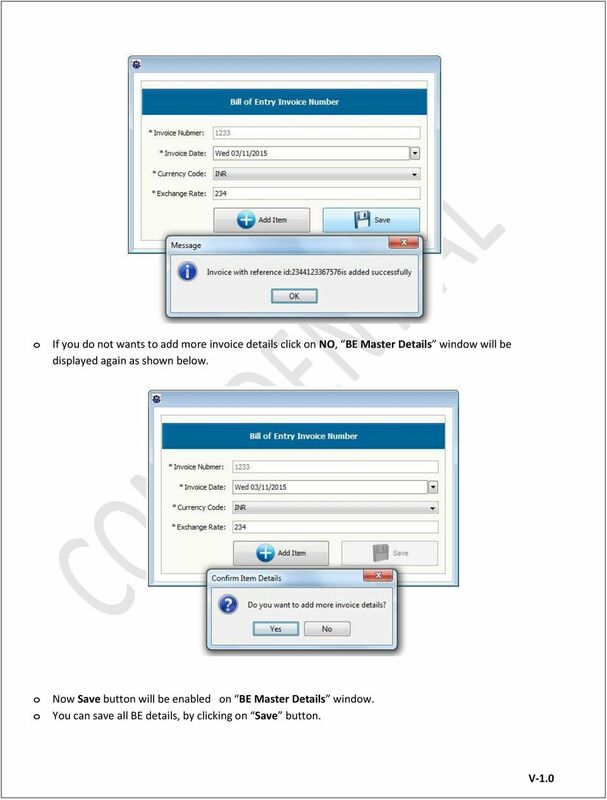 Create Secndary User windw will pen after clicking n Create User buttn in Cmmissinerate menu. Create Secndary User windw will prvide tw buttns: I. Create User: This buttn will create user after prviding all required field such as Name, Rle, etc. by cmmissiner. Rle may be Maker/Checker/Mdifier. II. Cancel: Cancel buttn will clse Create Secndary User windw. After prviding all required field when user clicks n Create User buttn then pp up will appear User is registered successfully. 30 3.1.6 Manage Users: vi.) vii.) It is restrict t use fr cmmissiner t manage user. Manage Users windw will pen after clicking n Manage User buttn in Administratr menu. Manage users windw will prvide fur buttns : I. Display: Yu can view summarized details f all users such as Name, Lcatin and etc. by clicking n Display buttn. II. Delete: Yu can delete selected user by clicking n Delete buttn. III. Cancel: Windw will be clsed by clicking n Cancel buttn. IV. Change Admin: By clicking n Change Admin buttn, Manage Admin Details windw will pen. Where admin can change admin details like: Name, ID, Passwrd etc. 31 When user click n Delete User buttn fr selected rw then a pp message will cme as shw in belw image. 32 Change Admin: After clicking n Change Admin buttn n Manage users windw, belw windw will pen. Manage Admin Details windw will prvide tw buttns: I. Change Admin: Yu can change admin by prviding Current Admin Id and Current Admin Passwrd with all new details, which yu want t change. II. 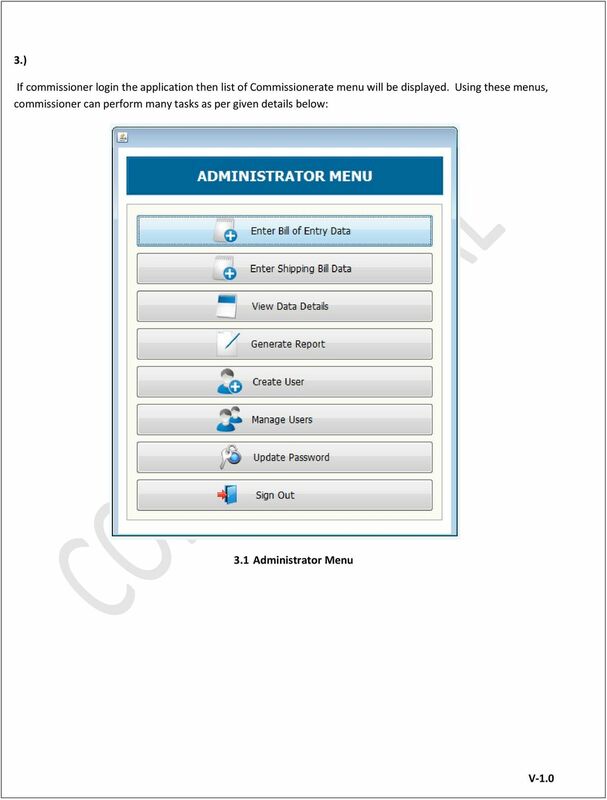 G Back: Manage Admin Details windw will clse. And user will g back t Manage users windw. After clicking n Change Admin buttn, pp up will cme The admin is changed successfully. 33 3.1.7 Update Passwrd Change Passwrd windw will pen by clicking n Update Passwrd buttn n Administratr menu. User can change their passwrd by Change passwrd windw. Change passwrd windw will prvide tw buttns: I. Save: By using this buttn user can change his/her ld passwrd with new passwrd by prviding his/her ID. II. Cancel: Change Passwrd windw will be clse by clicking n Cancel buttn. After prviding all required fields when user will click n Save buttn the pp up will cme The passwrd is changed. 37 5.) Steps f data flw: 5.1) Rles n Custm Lcatin : There are fur rles n custm lcatin as described belw: 1.) Maker: Maker will fill the frm. 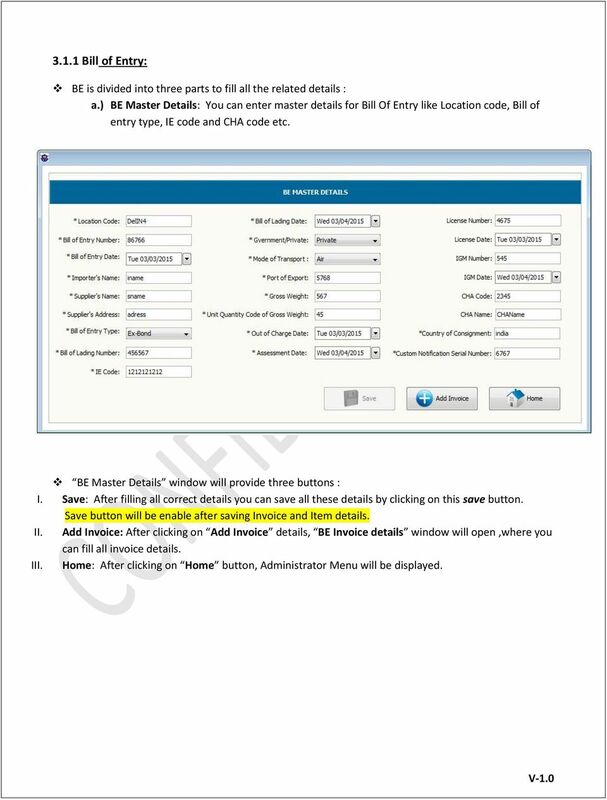 Maker has right t fill and view Bill f Entry Details / Shipping Bill Details. 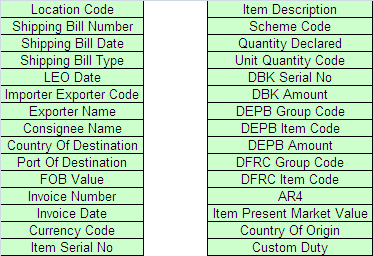 When maker submits Bill f Entry Details / Shipping Bill Details then these details cmes t checker. 2.) Checker: Checker will validate the frm. Checker als has right t fill and view Bill f Entry Details / Shipping Bill Details. 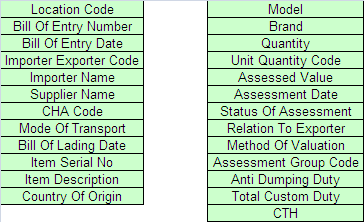 When Maker submits Bill f Entry Details / Shipping Bill Details then these data cmes t checker fr validatin. Checker will check all the details and if all details are crrect, checker will submit Bill f Entry Details / Shipping Bill Details. After submitting data by checker, data will cme t mdifier. 3.) 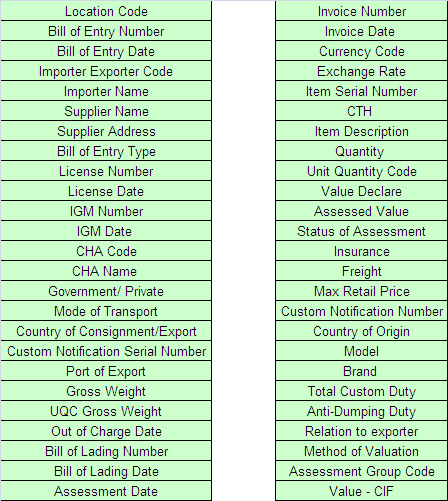 Mdifier: When checker submit Bill f Entry Details / Shipping Bill Details then data cmes t mdifier. Mdifier has right t mdify details, if details are prper then mdify can submit the data. When Mdifier submits the details then it cmes t cmmissiner. 4.) Cmmissinerate : Cmmissiner will apprve the frm. 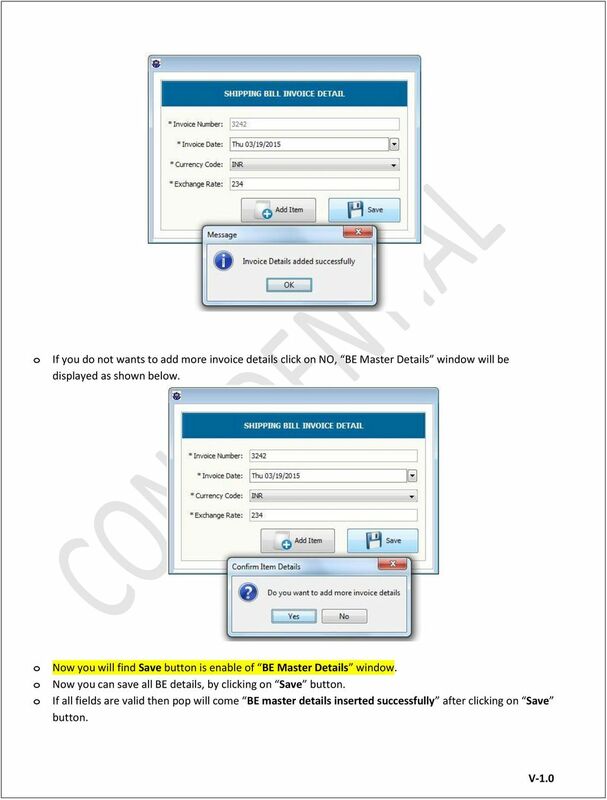 Cmmissiner has all the writes t mdify and view Bill f Entry Details / Shipping Bill Details. When Mdifier submits the details then it cmes t cmmissiner fr apprval. After submitting the details, cmmissiner can generate the reprt. Reprt may be fr ICEGATE/DGCI & S and DGOV. Telelink 6 Installatin Manual Table f cntents 1. SYSTEM REQUIREMENTS... 3 1.1. Hardware Requirements... 3 1.2. Sftware Requirements... 3 1.2.1. Platfrm... 3 1.2.1.1. Supprted Operating Systems... 3 1.2.1.2. 1) Update the AccuBuild Program to the latest version Version 9.3.0.3 or later. Steps to fix the product is not properly fixed issue for international clients. 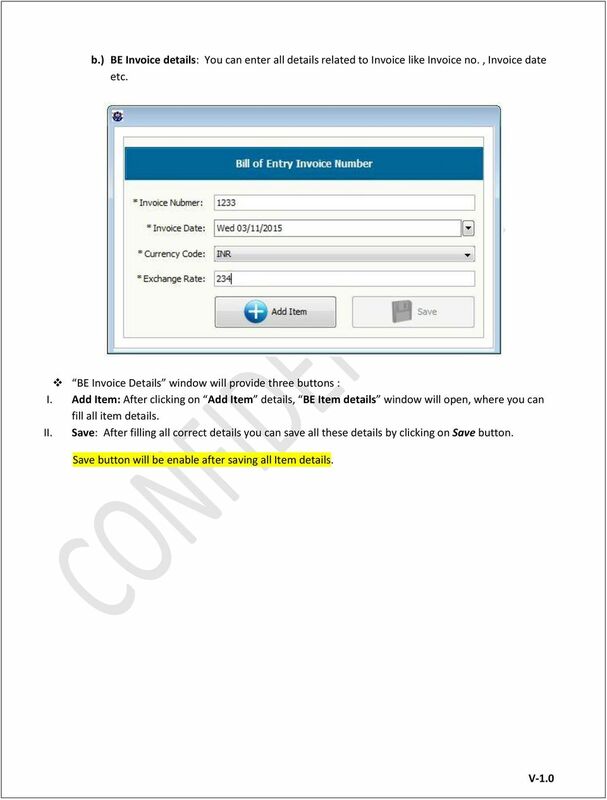 USER GUIDE Outlk Plug-In Send Cnference Invites frm Outlk Scheduling cnference calls and always typing in the same dial-in number and cnference cde can be a bit tedius, especially when yu re in a hurry. State Bank Virtual Card FAQs 1) What is State Bank Virtual Card? State Bank Virtual Card is a limit Debit card, which can be created using the State Bank Internet Banking facility fr ecmmerce (nline) transactins. Setup and Lg In T get Avaya IP Sft Phne installed cntact the GWIT Help Desk at (202) 994-4948 (GWIT) The Avaya IP Sft Phne Cmmunicatr will be pushed t yur ZenWrks Applicatin Windw n yur telecmmuting laptp.